Darling. Thank you SO much for these first photos of the newcomers to our world. Looking good!. 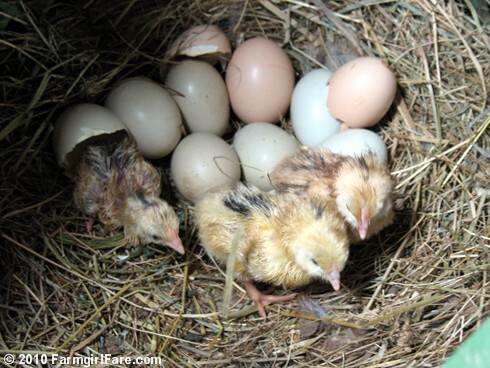 Are these mixed breed or a specific breed hatching out? Hi. I just stumbled across your blog. I'm just wondering, where in Missouri are you? I live in Jonesburg, Missouri which is halfway between Columbia and Saint Louis. I understand if you are keeping your location confidential. Thanks! I have enjoyed reading your blog, including lots of the older posts. Love the pictures of the animals! I look forward to visiting again. I just found your blog and am really enjoying it! I have Aracunas too, but no new babies since April. It was great to see some! beyond awesome! wow they are SO MUCH LARGER than the eggs! it's a wonder the egg just doesn't explode under pressure. Haha! So cute :) I can't believe that something that big can fold up small enough to fit inside one of those eggs. Amazing! 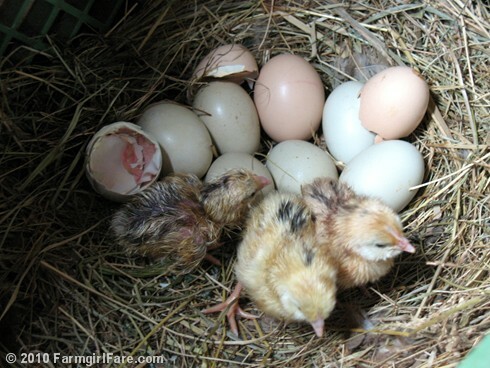 These chicks are official Missouri Mixed Breeds. No clue exactly what they are, but I do know that all of our chickens and chicks come from this mixed batch of eggs that Whitey was given by a friend of mine in June 2007 - and that hatched into these seven chicks. Little Whitey - who is 10 years old! - is the only pre 2007 chicken left. It's always nice to hear from somebody else in Missouri! We do keep our specific location private, but we're in the southern half of the state. How exciting! We are novice chicken keepers, but have yet to hatch our own eggs. I love reading both of your blogs-I gave you a "Happy 101" award over on my little blog this week because your posts inspire me!